Recent home prices survey conducted by HomeGain shows that 48% of Realtors think home prices will stay the same in the next 6 months. "The fourth quarter survey shows that Realtors believe that the first time home buyers tax credit has driven sales and stabilized home prices, for now," stated Louis Cammarosano, General Manager at HomeGain. HomeGain, the first website to provide free instant home values, today announced the results of its fourth quarter Home Prices Survey of Realtors® based on the responses of 928 U.S. real estate agents and brokers across the United States. The fourth quarter survey shows that 72 percent of Realtors think home prices will either stay the same (48 percent) or increase (24 percent) in the next six months. HomeGain's third quarter survey reported that 69 percent of Realtors thought home prices would stay the same (46 percent) or increase (23 percent) versus 47 percent of Realtors who thought home prices would stay the same (36 percent) or increase (11 percent) in the first quarter survey. Twenty one percent of Realtors surveyed said more than half of their transactions in the past three months involved a first time home buyer. Only 11 percent of Realtors surveyed said that none of their transactions involved a first time homebuyer. According to the fourth quarter survey, 41 percent of homeowners believe that their homes should be listed 10 to 20 percent higher than what their Realtors' recommend, up from 38 percent of homeowners who believed so in the third quarter and 36 percent who believed so in the in the second quarter. Seventy-six percent of home sellers believe that their homes are worth more than their Realtors' recommended listing price, up from 74 percent in the third quarter survey and 71 percent in the second quarter survey. Conversely, 62 percent of home buyers think that homes are overpriced, down from 64 percent in the third quarter and up from 59 percent of home buyers who thought homes were overpriced in the first quarter. Forty-two percent of Realtors surveyed indicated approval of Barack Obama's performance as President, unchanged from the third quarter and down from 57 percent in the second quarter. Thirty eight percent of surveyed respondents 'strongly disapprove' of the President's performance and 18 percent 'somewhat disapprove', earning the President a 58 percent disapproval rating. The President fared slightly better in the nationwide Rasmussen Daily Presidential Approval Index taken during the same period as the HomeGain survey, with his approval rating hovering in the 46-47 percentage range. “The homebuyer tax credit has helped, but where are the jobs from that huge tax burden so-called the stimulus bill? We need the jobs more than anything else to help the economy and housing market rebound,” noted Joe McAvoy of Virginia Commonwealth Realty. 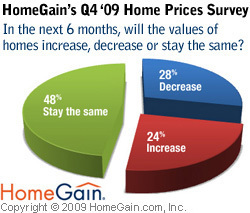 The fourth quarter HomeGain Home Prices Survey of Realtors was conducted from December 1-5, 2009. For complete survey results, including regional breakdown and real estate agent commentary, read the blog post, HomeGain Releases Results of 4th Quarter Realtor Home Prices Survey, on the HomeGain Real Estate Blog. Listen to survey respondents discuss the survey questions during a live teleconference call on Tuesday, December 15, 2009 by registering at https://homegain.webex.com/event. HomeGain® is a leading provider of online marketing solutions that connect real estate agents and brokers with home buyers and sellers. HomeGain offers free services to find and compare real estate agents, research home values, and view homes for sale. Since 1999 REALTORS® have used HomeGain's real estate marketing programs, products and tools to connect to consumers, promote their services and grow their business. HomeGain.com receives an average of over five million web visits per month, ranking it in the top 10 real estate websites worldwide.